TOP 5 DANGEROUS ACTIVITIES TO DO IN AUSTRALIA! Have you ever wanted to go swimming with sharks or go rapid river rafting? Well now is your chance! Check out the top five dangerous and thrilling things to do whilst you’re holidaying in Australia! 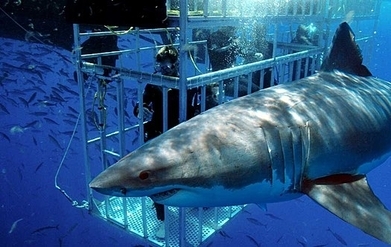 Have the most magnificent experience diving with sharks whilst being fully protected and secure in a metal cage. One place to definately visit in South Australia is Port Lincoln where you’ll be able to see the Great White Sharks in their natural habitat and get a closer look at the deadly creatures. Get the amazing experience of riding in a V8 race car which gives you an opportunity to get behind the wheel for a number of award-winning laps around the race course! From drifting to handling, braking to cornering, get to know everything you possibly could through this once in a lifetime experience! Get yourself away from the comfort of your warm hotel room and explore Australia across the Barron and Tully River in a raft boat! Lots of fun for the entire family (13 & over) and a great way to brighten up your day! Want to check out the beautiful wildlife of Australia whislt camping under the stars? Head to Alice Springs for unique experience and get a taste of Australia’s nature whilst quad biking through the desert, sand dunes or rainforests in Queensland. 5. Climb the Harbour Bridge! Any adventure lover will absolutely adore the experience of climbing the Sydney Harbour Bridge and feeling a sense of accomplishment when being over 135 meters high! What are you waiting for? Head to Australia now!